Research Highlights in Technology and Teacher Education 2011 . Published 2011 . ISBN 978-1-8800-9488-4 Publisher: Society for Information Technology & Teacher Education, Chesapeake, VA. In its third year of publication, SITE’s Research Highlights in Technology and Teacher Education has become one of the “most viewed” journals in the extensive holdings in the AACE digital library (EdITLib). The evolution of Research Highlights reflects a careful nurturing by previous SITE presidents Gerald Knezek and Ian Gibson, along with the critical organizational support provided by AACE CEO Gary Marks. Of course, an academic journal has little merit without critical and timely scholarship. SITE’s Research Highlights is quite fortunate to have Cleb Maddux, University of Nevada Reno, serve as its Senior Editor since its inception. Dr. Maddux has provided steady and rigorous guidance to all those associated with publication of Research Highlights. I am happy to report that he believes that the quality of the publications “has been improving steadily,” with a bumper crop of stellar articles in this year’s edition. Each year, SITE designates leaders from its membership to serve as co-editors for the Research Highlights to be published in conjunction with its annual conference. This year, Drs. Matthew Koehler and Punya Mishra worked closely with Dr. Maddux, and other SITE leaders, in producing the 2011 Research Highlights in Technology and Teacher Education. To be considered for publication in Research Highlights, a submission first has to be accepted as a “full paper” at the annual SITE conference. Subsequently, those full papers undergo additional rigorous review and editing (I have been told that no papers are published simply on the basis of their “full paper” status alone. Authors are always required to do additional edits and revisions to meet the high standards of Cleb and his team.) This year, a total of 1272 submissions, from the 351 accepted as conference “full papers were considered. Of those, only 31 were selected for publication in the 2011 Research Highlights in Technology and Teacher Education. In the end, a successful journal succeeds only based on the quality and rigor of the work submitted for publication. SITE’s Research Highlights is fortunate to have an outstanding cohort of international scholars and practitioners who have chosen to share their innovative work in this volume. I trust you will be as stimulated as I am by the high-level scholarship they have produced. 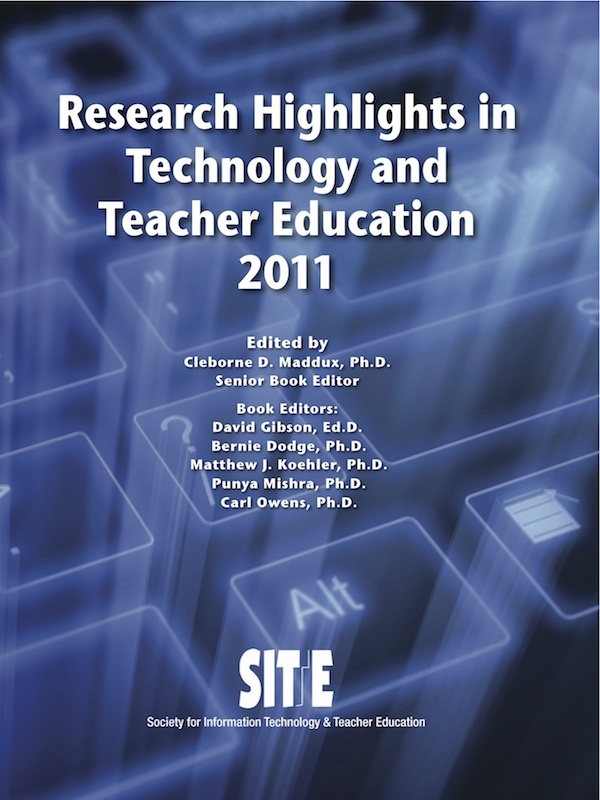 AT SITE, we are honored to have their work published in the 2011 Research Highlights in Technology and Teacher Education. Please enjoy this volume and consider using SITE, through its conferences and publications, to share your work with our growing international community. C. Maddux, D. Gibson, B. Dodge, M. Koehler, P. Mishra & C. Owens (Eds.). (2011). Research Highlights in Technology and Teacher Education 2011 . Chesapeake, VA: Society for Information Technology & Teacher Education. Retrieved April 23, 2019 from https://www.learntechlib.org/primary/p/38606/.